Dream location in Cocotal Golf & Country Club! A 27 hole golf course fronting the Meliá Tropical Resort, with easy access to Bavaro Beach and only 15 minutes from the Punta Cana International Airport. Designed for a carefree life with top quality touches. 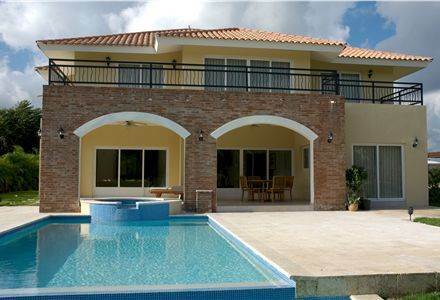 Integrated pool and Jacuzzi, and gardens with golf course views. These two-story luxury villas offer four bedrooms (each with bathroom and walk-in closet), two family rooms, kitchens, a dining room areas, and walkouts to the balcony and terrace from the living room and bedroom. They are air conditioned, kitchen appliances included except refrigerator, CATV ready, phone ready, maid’s quarters and service area. Quality specifications include Spanish roof tiles, Italian modular kitchen and floor tiles, granite worktops, German bath fixtures, mahogany doors, infinity pool and Jacuzzi. A rental program is available.